Located minutes from Port Carling, the hub of the lakes, where there are boutiques, art galleries, shops, plus several great local restaurants, this location is for those who want a value holiday in the hub of Muskoka! This is a classic 6 bedroom viceroy cottage with a massive stone fireplace that runs through the main living area and is a focal point for family gatherings. The fabulous lakeside deck and Muskoka room allow plenty of room to entertain. Muskoka granite and jack pines grace the shoreline where you will find a massive dock with shallow water at the shoreline and deep water off the end of the dock. There is a covered boat slip plus an extra uncovered slip for extra boats. Sun all day and glorious sunsets will make this the place to spend your sunny summer afternoons! Perfect for a family getaway! As part of the "Big Three" lakes, Lake Muskoka's Mirror Lake connects to Lake Rosseau and Lake Joseph through the Port Carling locks. Boat from the cottage into any of the Big Three lakes from this sheltered area of the lake. 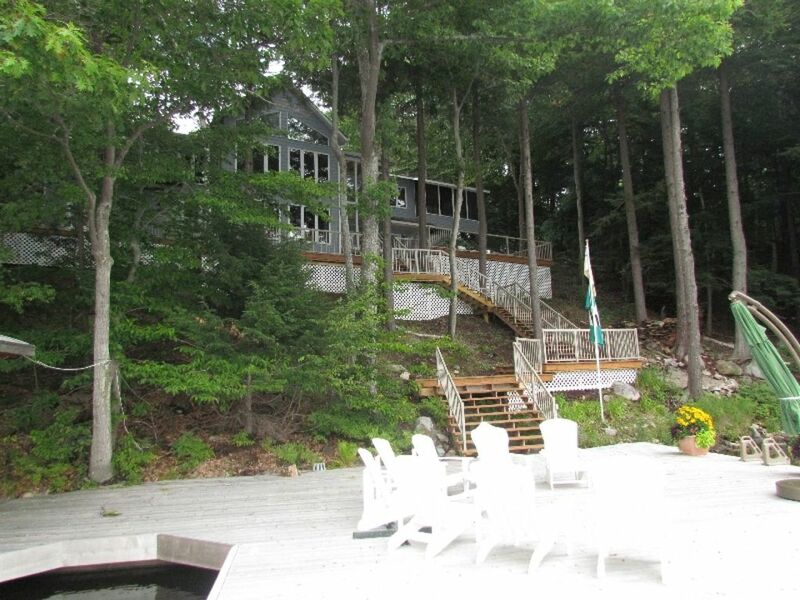 Sunshine and Sand In the Heart of Muskoka and just minutes from Port Carling, this wonderful family 4 bedroom family cottage on Lake Muskoka gets breathtakingly sunsets and all day sun on the dock. The Great room has a wonderful floor to ceiling fireplace and a dining table that seats 10 comfortably. The updated kitchen has modern appliances and an eating counter for friends to gather round. The screened Muskoka room is the perfect spot for dinner on a lovely summer's eve. The large main floor master has a king bed plus a master ensuite with soaker tub and shower. On the lower level there is a family room with fireplace and large flat screen TV plus a foosball table. Three guest rooms, plus two full baths complete the lower level. There is also a guest bunkie with full kitchen and bath plus two bedrooms, perfect for visiting friends. Minutes from Port Carling's finest restaurants & boutiques with an idyllic child friendly shoreline that is shallow and sandy at the shore and has deeper waters for docking at the 2 slip dock. This is a wish list come true for a family get away! Nice cottage but lots of stairs to the water! Manual should be revised as no drinking water available.